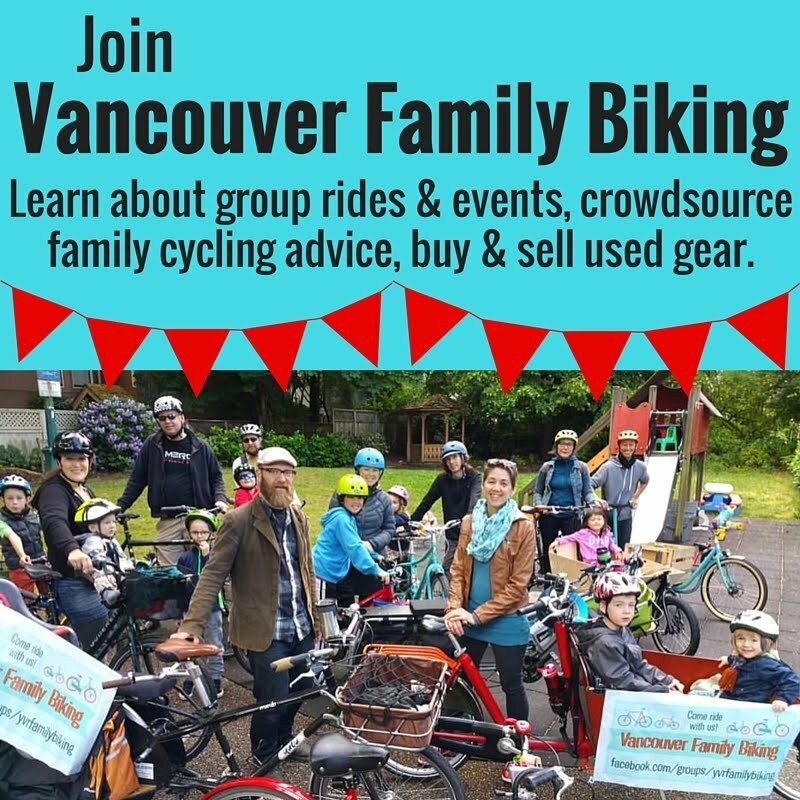 Last night we gathered with a couple dozen other people at Renfrew Skytrain Station & rode bikes along the Central Valley Greenway to Still Creek Park. The Twilight Crow Roost Bike Ride, organized by the Still Moon Arts Society followed the Vancouver crows that gather at dusk & fly together toward Burnaby. It was fun to hang out with friends as we pedalled along the bike trail. Bronte seemed to like seeing all the crows--she kept saying "bird" as we rode along with them. 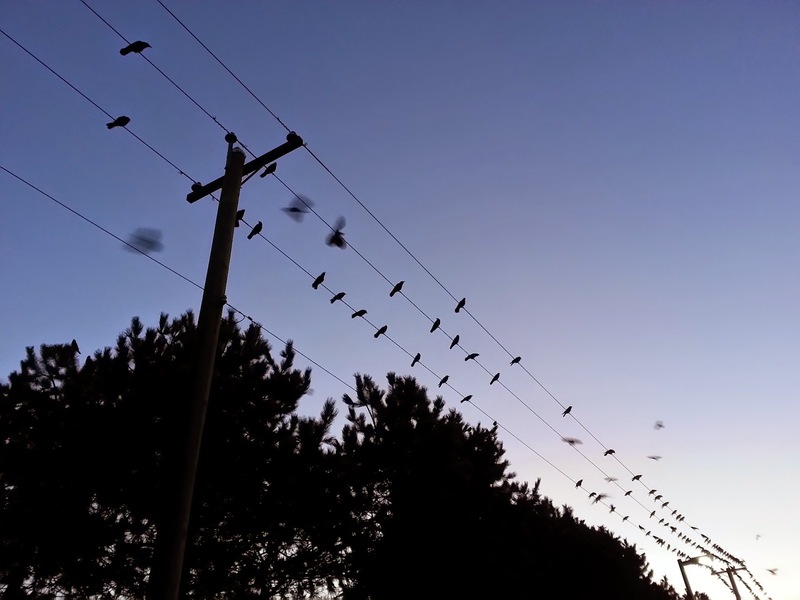 Toward the end of the ride, the crows flew thick in the air overhead, to land on power lines, fences, & trees, competing with our conversations with their cacophony of strident calls. If you haven't noticed the nightly murder of crows in the sky overhead at dusk, it's a funny phenomenon. They start flying just before dusk, gathering more & more along their way east until they mass into a swath thousands strong. 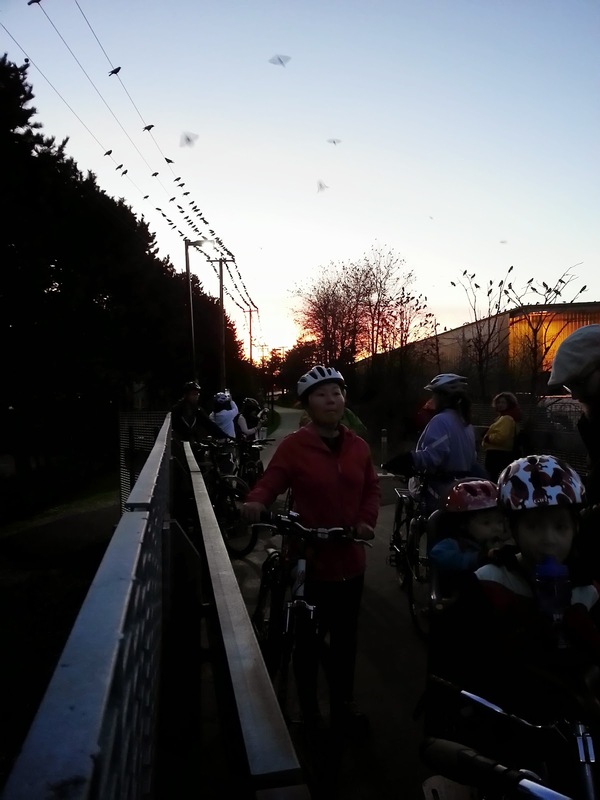 It's kind of magical to be gliding along on two wheels, surrounded by so many birds. They're such noisy, gregarious creatures & seemed to be heckling us as we stopped in Still Creek Park. One of the other riders shared a thermos of hot chocolate that she'd brought & we fed the kids snacks, then let them loose to run around a little. We'd only managed to arrive at the station just as the ride was starting, so we didn't have as much time to socialize there, but I had time to chat with a few people I had only 'met' before online at the park. I like the Central Valley Greenway trail because the majority of it is off road but it's quite direct, following the railway eastward. You can really relax & ride two or three abreast to chat along the smooth asphalt. Linnaeus loves watching the Skytrain go by overhead for a good portion of the ride. We've ridden along there several times in the past few months because it's a direct way to get to the handful of big box stores along Grandview before Boundary. The only downside to the ride was that the kids were a little underdressed. We just put them in their winter coats & mittens, but should probably have added an extra layer of pants & another sweater, since they weren't pedalling & got a little chilly on the way home. All in all though, it was a near perfect ride. I'm looking forward to getting out with a bunch of people again for another one soon--probably downtown to see the Chinese New Year Parade & Lunar Fest next weekend. I'll keep you posted!